As we all know, robots will one day take over the world, and we will all be their slaves (cue eerie music). But until that fateful day arrives, you can turn the tables on our robot overlords and use them to your advantage while simultaneously getting fit in the process. Step aRobix allows you to completely customize your Step workout routine, including working out to your favorite music from your library. BPM detection changes your robotic instructor to match the beat of the music, making her/it move to YOUR workout. 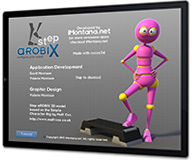 Choose from many standard Step aRobix hand movements, feet movements and left or right starting positions. In other words, your routine can be exactly what you want. Integrated Heads Up Display (HUD) shows timing information, music being played and the next step about to play, as well as a countdown until the new step, and when to switch feet. So get off of the couch and show the robots who owns who! Step aRobix: configure your sweat!